A sweet potato casserole recipe, made with mashed sweet potatoes and a crunchy pecan topping. Scroll down to see more sweet potato. 2 BOil sliced sweet Potato in Water unTil tender. Drain. 3 In a large bowl, blend the Potato unTil Creamy. 4 Stir in the Butter, Brown Sugar, Orange Juice to taste and a dash of Ground Cinnamon. 5 Spread the sweet Potato mixture into a 9x13 inch pan. 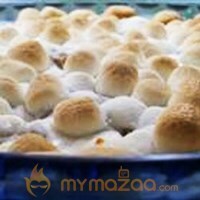 6 Sprinkle the miniature marshmallows over the top and bake at 350 degrees F (175 degrees C) unTil golden brown.